So, as you may already be aware if you follow me on Instagram, I made this cheesecake for a café here in Berlin last weekend. I was sort of excited about it (GAAAAAH!). Just a little. 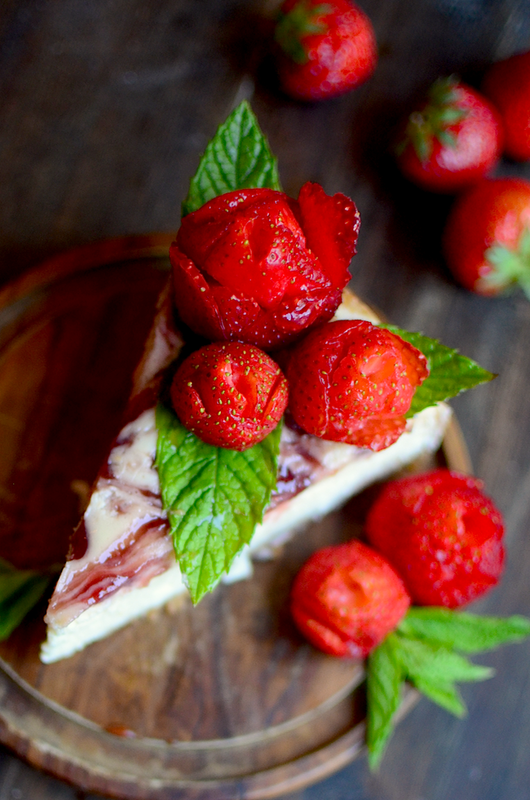 It was approximately 1 million degrees and humid outside that day, and the cheesecake, strawberries, and I were all sweating furiously as I made the final touches before dropping it off at the café. I now know why pregnant women aren't supposed to complain when they experience prolonged sweatshirt weather in June and that they should be careful what they wish for. After Samuel and I dropped the cheesecake off at the café, we decided to go for a swim at Schlachtensee. I second guessed myself all the way there. 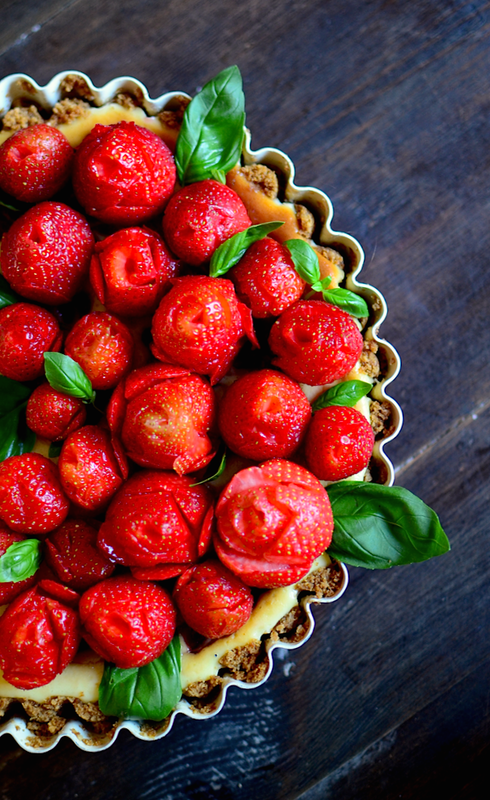 Would the strawberry roses hold up on this hot day? Did they even actually look like roses at all? Was the cheesecake creamy enough? 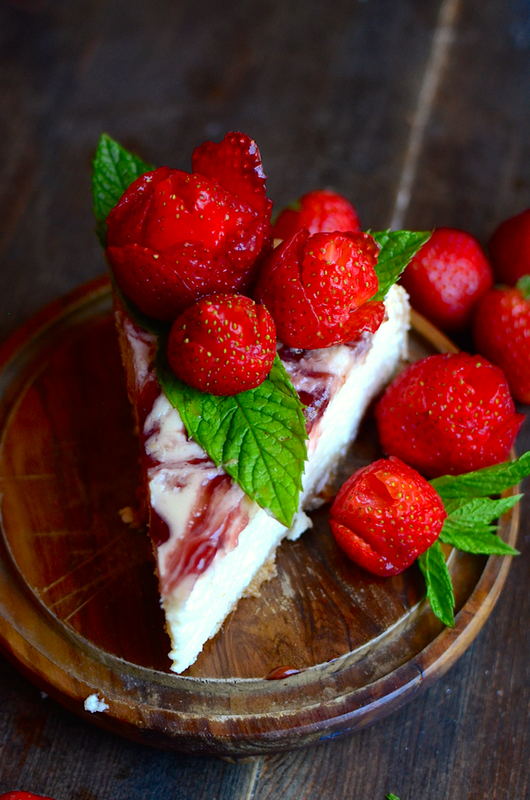 Would the Germans even like an American style cheesecake? Could I ever sell cheesecakes at our own café someday if they all turned out this pathetic every time? My worries began to subside as we made our way through the woods to the edge of the water. Samuel and I were floating in the middle of the lake, chatting, when suddenly a middle-aged, long faced man swam up to us and started staring at us. We continued chatting awkwardly. After a couple minutes he said in a thick French accent, "Are you speaking about the Brexit?" "Well, you should be speaking about it, not some silly things," he said with a wave of his hand. "Are you ladies and gentlemen British?" I glanced around for the ladies and gentlemen he was speaking to. "No, we're Americans," Samuel said. "Oh," he said, looking disappointed. "Have a nice day," he said, and then he was gone. After our swim, Samuel was putting on his shorts by the edge of the water when we suddenly heard a PLUNK. Something had fallen out of his pocket into the water. He reached into the water and pulled out our iPhone. So, if any of you happened to be at Schlachtensee in Berlin last Friday, those screams of terror you heard are no longer a mystery. We frantically wiped it off and pressed all of the buttons, and to our surprise... it was totally fine. 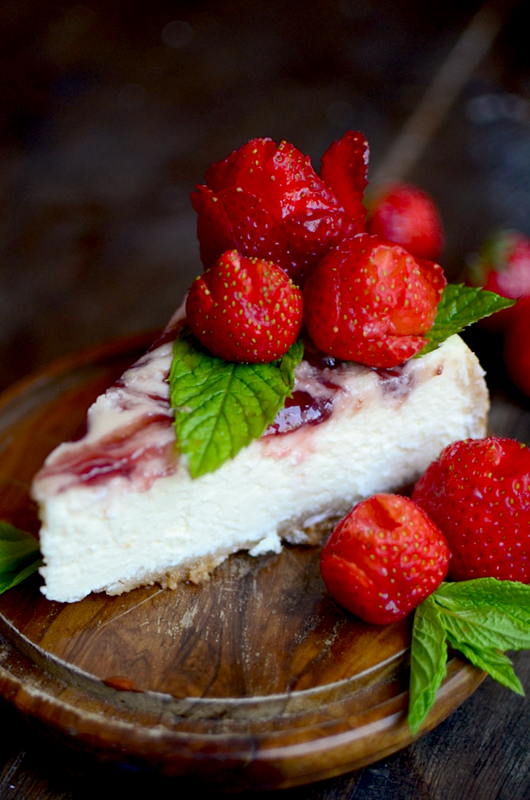 And luckily, because I had a text from the lady at the café asking me to bring TWO MORE cheesecakes for the weekend. Apparently it was a hit. 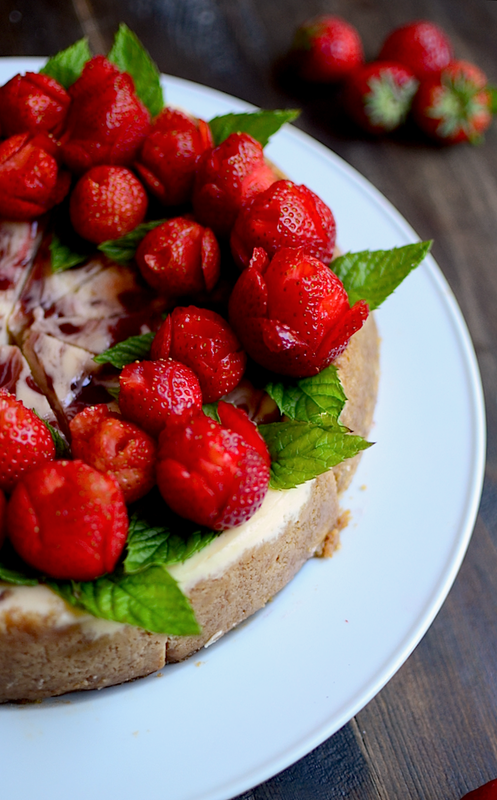 So, that is the story of how I made three strawberry cheesecakes last weekend. I hope you make one or two yourself. Making the strawberry roses was actually really easy and made it look really awesome, if I do say so myself (yes, my confidence is back). Preheat the oven to 300ºF (150ºC). Grease a 10 inch (25 cm) springform pan and line the bottom and sides with parchment paper. Crush the graham crackers (I used a food processor so they would be very fine). Add the salt, sugar, and butter and mix well. Pour mixture into prepared pan. Press some of the mixture firmly up against the sides with your fingers, then use a glass with a flat bottom to press the rest into the bottom. Refrigerate while you prepare the filling. In a large mixing bowl combine the cream cheese (make sure it's softened! ), sour cream, and sugar. Beat for a few minutes until the sugar is dissolved. Add the eggs and vanilla and beat just until combined. Pour over the crust in the pan. Warm up the jam in the microwave until liquidy. 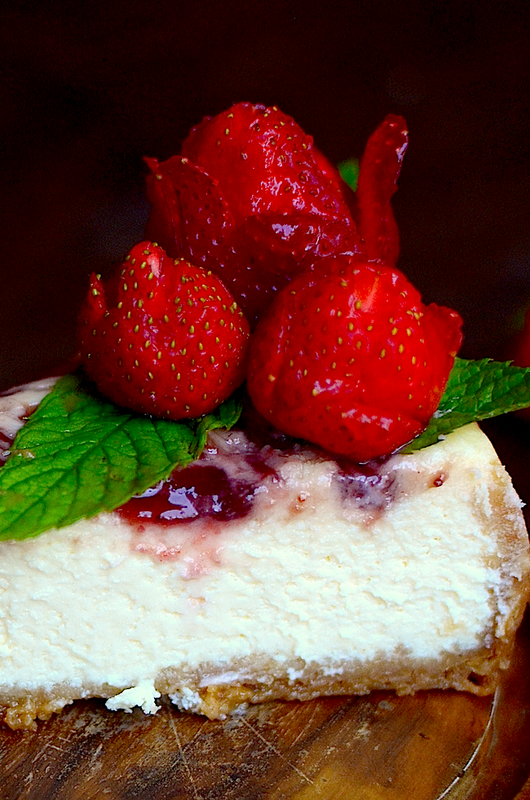 Drop little spoonfuls around the top of the cheesecake and then swirl them with a toothpick. Put the cheesecake on the baking sheet and wrap the sides with two damp dish towels to prevent the outside of the cheesecake from cooking too quickly. Don't worry, the towels won't burn if they're damp. Just soak them in water and ring them out before you put them in the oven. Bake for 2 hours. Remove from the oven and cool on the counter for about 1-2 hours before refrigerating. Refrigerate for 6 hours or overnight. 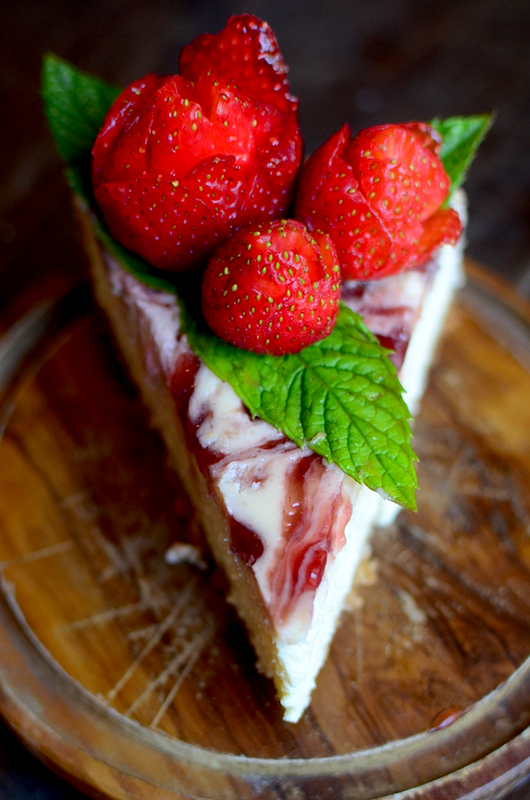 To cut the strawberries into roses, cut 4-5 petals on the outside of the berry first. Make sure you follow the shape of the strawberry when you cut. Then cut one more layer of petals. Then cut the center into a spiral. You can find a tutorial here. Use basil or mint leaves to complete your decor. Enjoy.